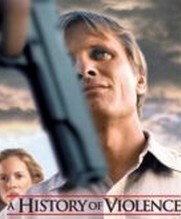 Viggo Mortensen. Maria Bello. Ed Harris. William Hurt. Drama. Thriller. Violence. Art House. Gangster/Mob. 01 Dave B's must sees. Recommended. Rob Recommends. Guardian 1000 Must See (2007). 01 Kelly's Heroes. In the small backwater town of Millbrook, Tom Stall lives an uneventful but contented life. A loving father, husband and the owner of a small but bustling cafe' he's a pillar of his little community. When two sadistic robbers threaten Tom his staff and his customers, one fateful night, he reacts without mercy. Hailed as a hero, Tom is uncomfortable with his new status and when strangers arrive from the city it becomes increasingly obvious why, it would seem Tom has a past and oh boy it ain't a pretty one. An atmospheric, tight and accessible thriller from Cronenberg, A History of Violence is a surprisingly simple tale about confrontation and the unswerving determination of one man to regain the only life he wishes to remember.